I have been aware of the SSP since the Kickstarter began and have been curious about how the SSP’s development has been progressing. Also, recently, I started getting really interested in the DSI Prophet X. I have had some mixed experiences with DSI in the past, also I don’t need a big synth with keys taking up space in my music room. So, I started thinking about alternatives. I have some Euro, a Linnstrument and could make a 6U that is mainly built around an SSP and supporting modules. So, do you think that the SSP would work as a nice complex sound source. Say, stacking samples and wavetables being controlled/played by the Linnstrument? In short you have the right idea and your name for your build seems pretty apt. Would the SSP be your sole/main sound source? I enjoyed reading your thoughts behind putting that specific configuration together. I will go ahead and give a little more background, answer your question and ask one or two more. Not too long ago, I had about 15u of Euro, a Synton Fenix 2, TTSH & 1601 sequencer clone, Knas Ekdahl Polygamist and a few other musical devices (drum machines, Ciat Lonbarde, etc). I also have had Serge and Buchla modular systems. I have a 6+ years experience with Modulars and enjoy my time with them. As I evaluated my musical goals against my time available for creating and the gear I had to support the goals, I decided to make a change. I sold a little more than half of the Euro, the Fenix 2 and a few of the other musical devices in order to go back to Buchla 200e. 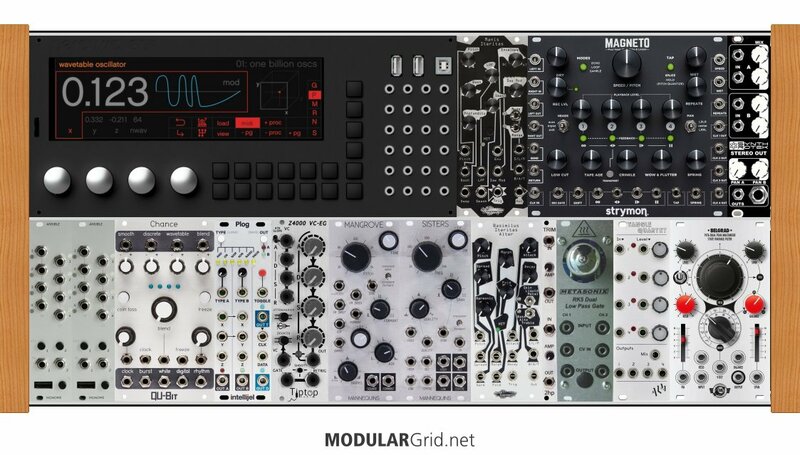 I have a full 18 space case - every module has preset recall functionality but there are a couple of modules from outside manufacturers that have cracked the preset functionality. This preset recall is critical to my goals: it supports the way I work and is a great tool when playing out live. So, I currently have 6U + Euro in boxes. I need to decide whether to sell it all, sell most of it or put it to use in a way that is really different from the Buchla. Samples/Granular/more Typical Wavetables/subtractive synthesis are different from the Buchla. The Prophet X brings some of that to the table but at the end of the day - it seems like more than the sum of it’s parts and makes cool soundscapes, it is like a hardware Omnisphere. So, hardware Omnisphere is really my goal. Time spent learning SSP. How intuitive is it? I don’t intend to program/compile any VSTs or anything. Could I meet my goals with what I already have? Between an iPad, Synstrom Deluge and Linnstrument (plus sampling from Omnisphere) can I work out a system for nicely stacked soundscapes? I think I can and the solution be smaller and cost way less - actually net me money since I would sell more Euro. I am sure this would be more fun, it would be more inspiring and ultimately make cooler sounds. I am not a massive fan of the Deluge that I have. So far, I just haven’t been engaged with using it. So, I would really be looking at an iPad solution since I don’t see other hardware that would meet my wants here. This system would stand on it’s own. I would be cross-patchable with the Polygamist, TTSH, DFAM, Boog Model D. So, I would have a nice counterpoint to all of those analog devices. 2DJs: to answer your question- in the attached potential rack, other sound sources are Manis Iteratis and BIA fromNoise Engineering as well as the Three Sister since it can be used as a Sine wave Oscillator. I have other sounds sources not pictured above like an MI Elements and Mannequins Mangrove. I also have an Audio Damage Odio which is a fun way to get iPad audio into a system. I am looking to keep this to a reasonable size so the rack is 208 hp total. Also, as another piece of information, I have considered grabbing an MPC Live to do layering of samples and wavetables or other synth sounds etc. for the portable Omnisphere/Prophet X functionality I am looking for. Welcome! If you haven’t already check out some of the demos covering the wavetable oscillator and granular module. There is also a sampler module of course, with crossfading and multichannel layering features. @deltaphoenix might be interested in the patch you demo’ed at superbooth 2018 which featured layered wavetable oscillators and granular processors. But yeah, a little more limited than I would hope. A part of me said, well how about an Octatrack but then I was like yeah…that interface wasn’t for me. Yes, definitely want to hear that! just FYI - MPE support is already there on the SSP and you can build almost any synth architecture you want in the patcher grid, mixing sample playback with wavetable or granular stuff etc. Yeah, it really looks like the best solution AND super fun. You can’t blame me for checking out alternatives before committing to a $2000 purchase. Although, I do have a Buchla 200e modular so I will pay for the right tools for the job. Yeah, it really looks like the best solution AND super fun. @deltaphoenix It’s definitely an exciting time here in Percussa land with new features and functionality being added and/or improved on rapidly which is refreshing to see IMHO. Just understand that this is a newly released product that may or may not have the exact functionality that you’re looking for straight out of the box. I get that the SSP is still under development. I have been checking out other threads, seeing Bert weigh-in, asking clarifying questions & sometimes adding features or squashing a bug. Very Cool! I might have some ideas already but I want to spend time with the SSP before suggesting anything. I have started selling some stuff so I can join the team very soon! Congrats! I would say, say goodbye to your sleep, but as this is not your first child, you have long since bid it goodbye! Congrats on the SSP and please let us know if you have any questions! Congrats @deltaphoenix, all the more reason when you cant get back to sleep to play on the SSP, feed/SSP - Change nappy/SSP - Wont stop crying/settle and put to sleep/SSP. ‘felicitations’ to the whole family!